On Saturday I was lucky enough to be one of the Boston Bloggers who attended Wayfair's Home For The Holidays at their new offices in Copley Place. As Emily said it was like Disney for bloggers! 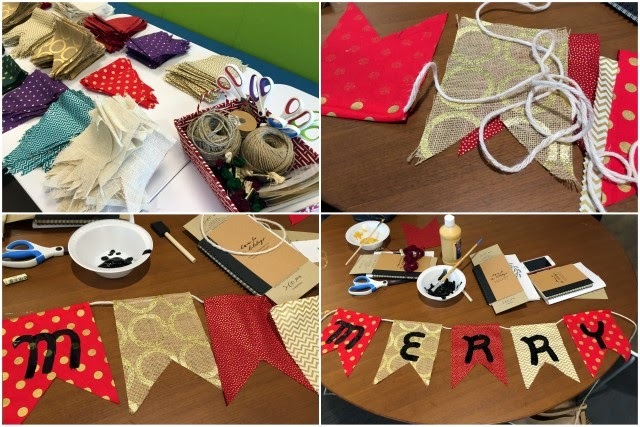 It was all things holiday - DIY crafts, table decor, meal planning and more. SO.MUCH.FUN! The Wayfair office is awesome and it was all decked out with holiday decorations! Many of us were snapping photos of the gorgeous tree surrounded by gifts. Little did we know that those weren't just empty boxes. At the end of the day we each got to pick one and they were real presents (you'll see what I got at the end of this post)! We were broken up into groups and I was in group Mistletoe. We attended the break-out sessions in our small groups then had lunch and the keynote speakers with the entire group. The day started out with keynote speakers Christiane Lemieux, VP of Creative at Wayfair and Heather B. Armstrong, aka "Dooce" and very famous "mommy blogger" sharing their thoughts and experiences. It was great to hear from these two fabulous ladies, both who are very talented and successful. Following that we went to our first break-out session, DIY Pennant Banner. The best part of this DIY is that the Wayfair staff had done all the prep work then did all the clean up when we were done. So we just got to do the fun part. I love banners and this was so fun and easy to make. I plan to hang mine with my Christmas cards that I receive and display! Next up, Tabletop Styling with Abby Larson of Style Me Pretty. Abby shared her expertise on how to decorate a table for any dinner party. 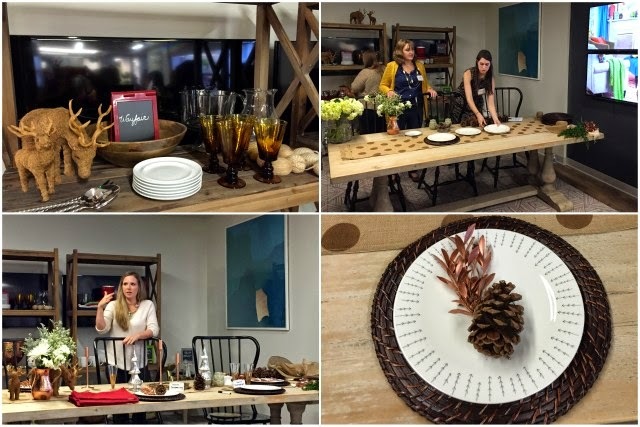 Then some bloggers in our group got to try it out using Wayfair's stuff = so fun! Abby is so down to earth and fun. I really enjoyed hearing from her. Since I don't even have a table in my teeny tiny Boston apartment I won't be using any of her tips right now but I'll be storing them away for the future! Then it was time for lunch made by Kitchensurfing and was so so good. We had our choice of several fancy grilled cheese sandwiches, salad and soup. I had the curried butternut squash and it was so good! If you don't know about Kitchensurfing then check out the website - it is such a great concept. A chef comes to your house and cooks then meal for your dinner party. Then they clean up too! 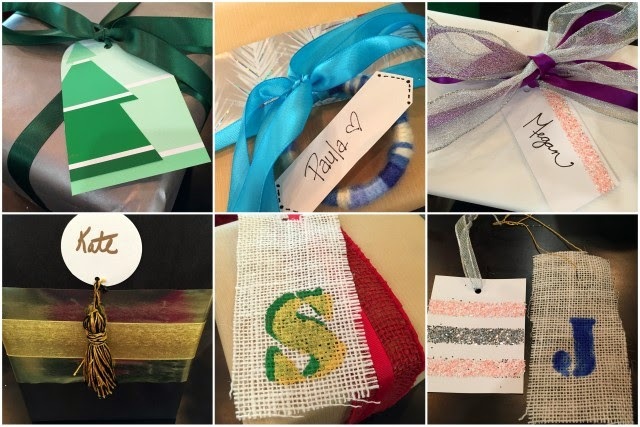 Next break-out session, DIY Gift tags. 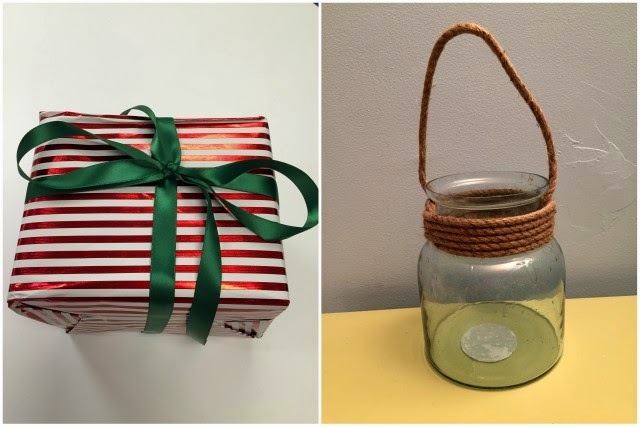 Below are samples of each gift tag that we were taught how to make and then the last photo (bottom, right) are the two tags I made. The best thing I learned during this session was to use double sided tape for glitter. So much easier than glue. Genius! Last break-out session, the least crafty of the day, SEO Q&A with two of the SEO staff members from Wayfair. Honestly I really have never worried about SEO with my blog since I have no intention of becoming a famous blogger. But I must admit that this session was great! They really simplified things so that novices could understand it all. I definitely took away a few things that I could be doing differently. Very helpful info and I look forward to receiving the slides via email so I can review all the info and then apply some of it to my blogging! We ended the day with one last keynote speaker, Jeremy Sewall, who talked Menu Planning. He is the owner of several Boston restaurants including Row 34 and Island Creek Oyster Bar. He brought along some oysters for us to try (which I did not since I don't like seafood). He had some really practical tips for preparing a holiday meal like to do a few things really well and buy the rest (like buy pies from a bakery so you can focus on your main dishes). And then. . . the grand finale. . . wine! Andegavia Cask Wines treated us to glasses of their wines which was such a lovely way to end the day. We all got to mingle and chat about all the fun things we did and learned. This was such a cool opportunity to have right in our own backyard. 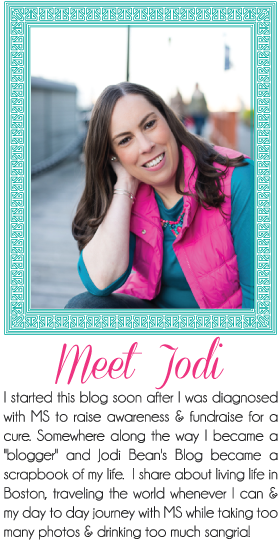 I loved that we didn't have to travel to another state for a big blogger conference but still had all the benefits of one of those conferences. Oh and here is my present! I LOVE it! It is a hurricane for a candle but I plan to put Christmas bulb ornaments in it for the Christmas season! I can see many other uses for it too. I can't find this exact one on the Wayfair website despite looking through several hundreds of them on there. I did find a few similar ones though. You can view them here, here and here. Thank you to Wayfair and all of the sponsors. I had such a great day! Thanks also to the Boston Bloggers who organized this event, Kate and Alison. You ladies rock! 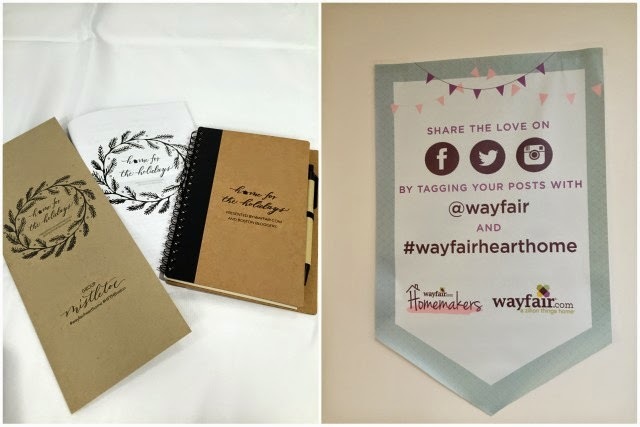 If you want to see more photos you can search the hashtags #HFTHBoston #WayfairHeartHome on Instagram! Such a great time and lots of fun! On My Mind. . .